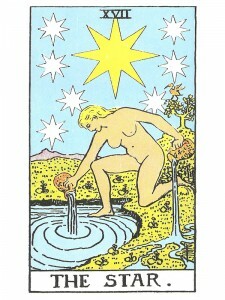 The Star represents hope, peace and continuity – fluid thought and intuition. The “present” is based on action and will – the “future” is based on understanding and hope. To resign yourself to the routine and remain “quiet” is the “sleep” of your will. Awaken your will – exercise your “choice” – your ability to say “yes” to spirit and “no” to the transitory things of matter. Hope directs spiritual growth into the world – it allows us to see that each day is a unique event which will never be repeated. Even the most mundane and commonplace abilities are worthy of aspiration – a “star” is in the eye of the beholder. Hope provides the “possibility” of the complete unity of matter and spirit – it is the “fruit” of this marriage of opposites, inviting us to believe in the unity of the two and to work towards the realization of that unity and ultimately – to understand that hope and growth are the same. There is joy in work – only when it is elevated above the “spirit” of slavery. Uplifting values are essential in the process of becoming enlightened – every word can become magical if it is sincere and filled by faith to the point of setting hope from above in motion. Hope, true creativity and tradition are essential to assure that spiritual truth is not forgotten – they are the agents of growth. Calming peace after the storm as you experience accomplishment of the goals you have developed – renewal after a calamity. New freedom – you have come through the hard times, undergone emotional upheaval and you will now know inspiration, hope, health and spiritual gifts beyond your belief. You are well blessed and can expect much spiritual help and guidance in all endeavors. You are on the right path – you have built a good foundation. Continue to “hope” and you will achieve your goals. Your health situation will improve for you are surrounded by strong spiritual forces. The truth can be found in the depths of your subconscious through meditation – hope, faith and courage are the keys in facing your problems for you are developing intuition and going within will aid you in finding the truth. Once your mind is able to sustain its concentration – it can penetrate to the real nature of whatever it is placed upon and come up with a meaning that is helpful to you. You desire to know the truth – to be open, honest and communicate with nothing held back. Choose to be a guide – illuminate others. New concepts and intuitive realizations bring feelings of accomplishment and success that opens you to an inborn state of “grace” in which all growth is effortless – a joyful acquiescence to life as you experience revitalization and the renewal of your vital structures. In reflection, when your mind is elegantly poised in balance with other levels of the psyche and the body, you can remember the wise guidance of your innate psyche knowledge which requires you to follow your own aspirations and abilities in order to illuminate future possibilities. You now recognize your ability to surpass Self into a sense of Self + Universe. Pour your energy out freely – “feel” your confidence – KNOW and trust that Life will continually supply you with new energy. Choose to stir up the Universal life energy by pouring your own into it – use your active imagination and visualization. Accept your desire to be active in projects that will produce enlightenment and conscious raising for all mankind – to be the “center” of attention and gain public recognition or be the spokesperson for others. Transformation from darkness into light – your unconscious is changed into the ecstatic awareness of the super – conscious. Take this energy and create with it – objectify your spiritual energy in your creations. Give of yourself with compassion in your service to others so that they may find their own “light”. No amount of work can exhaust your inspiration as long as you remain connected to the inner sources and each completed work will give you new inspiration. Allow your “inner” Self joy – allow your sensitivity and passion to express itself – directly experience your unconscious mind. Your ability to feel the truth and to act will make you a vehicle through which the truth can manifest itself as you experience your “inner” calm. Here is the seventeenth stop. This is the state of mind after profound insight, mind illumined by the heavens. Fireworks. As The Tower is God’s grace, The Star is what you do with that grace. Here is the mind’s acceptance of responsibility for packaging and filtering spiritual input down to the Emotional and Physical Planes, the symbolism of pitchers of fluid knowledge pouring into water and land alike. This may seem like antiseptic poured on an open wound – there can be pain as the medicine effects its cure. There is undoubtedly major change in the offing and you must decide how to implement it in everyday life. Hope derives from our acceptance of the pain of the moment, which grows into an understanding of the present situation from a broader and longer range perspective. The Star offers hope, optimism, aspirations, productive mental growth, dedication to an ideal, and maximum expectations. Here are outer goals – the Moon will give inner goals. To think of our fate as being in the Stars is to say that our fate is in our highest expectations, our highest ideals. If something can be thought of – then it is possible. The mind is excited, active, with its taste of the future. Here you find the content of the message from a wide assortment of sources-from dreams, spirit guides, guardian angels in the guise of friends/family or complete strangers, synchronous events, books falling off shelves, and the list is literally endless. Here too is the recognition, the fame that accompanies the talent of expression, the embodiment of good ideas well executed. The star on earth is just so because of his/her ability to emulate the beauty of the stars in the heavens. In the first position: This lifetime asks that you use the formidable intellect you have been given to process the information that needs to descend from the spiritual into the Mental, Emotional, and Physical Planes. Be that as channeler, writer, translator, inventor or professional friend to many. Also, that you are simply destined to be among the best at whatever you do and to be well known for it. You have been given the means to convey to others the hope that you feel in every fiber of your body, because you know how beautiful things can be; you have seen how beautiful they already are. In the second position: You have already laid the foundation of a long-term goal and are very much working toward it, so that there is great efficiency in your physical/material world. Everything contributes to the big picture. You may be working with the information received in a prophetic dream or another rich source. Also, simply that you have been very busy and productive. In the third position: You need to be optimistic and set your goals at the highest conceivable level. Avoid any tendency to sell yourself short. In the fourth position: This is an early passion for success, for being the best and being recognized as, such. in love with your own dreams and certainly with very high expectations of realizing every one of them. In the fifth position: Much has already come your way but you are setting your sights, fining up your goals. Your mind is on top of things. Let your present optimism establish your benchmark for the future while you are thinking big. In the sixth position: Integrate those dreams, those goals and wildest expectations into your relationships so that they support each other. Here could be a test for the heart as the ego succeeds with its program. Will you enjoy your success? Will those who supposedly love you, love your success? In the seventh position: It is time to give your ego its just due. This year wants to see you open up all the stops. You will be drawn outward in the limelight of recognition and you should go more than willingly. In the eighth position: Much of your goal is unfolding right now. You are living your dream in realtime. You are the center of attention and rightly so. In the ninth position: The heart is centered on the mind’s directives. Desire is supporting the will. In the tenth position: Your goals, even your greatest expectations, will present themselves clearly and begin to unfold in your reality. Your star is arriving and it will be up to you to sustain its glow. I am glad that you are pleased with the website. A link to the E-books is provided on the Home page. I would like to thank you for building upon a fantastic resource and to point out to fellow readers the following. Each card has ten interpretations according to their position within a Celtic Cross layout. This would then be expanded upon if this card is reversed. The Star, for example, has twenty interpretations in total. Since there are 78 Tarot cards, that’s 1560 entries. This is brilliant. I was always looking for something like this as a website or a book. Have you considered creating an e-book? You would be able to cite the sources of your meditations upon each card too. Aside from my unsolicited suggestion, I wanted to show my gratitude to this work and gesture toward how helpful it will be for the self-inquiry and self-knowledge of others.